Newport Pagnell is a modern, thriving market town situated in the North West of Buckinghamshire. Newport Pagnell - Travel by coach - If you'd like to speak to someone about your journey you can ring Traveline on 0871 200 22 33. Newport Pagnell nearby station - Travel by train - Wolverton Station, Stratford Road, Wolverton, Milton Keynes, Buckinghamshire, MK12 5LQ. CCTV. Waiting room. Only parts of station step free access. Newport Pagnell - Travel by road - Newport Pagnell is about 2 miles north of Junction 14 of the M1 Motorway. The M1 is a north - south motorway which links London to Leeds. Newport Pagnell is about 50 miles from London and 145 miles from Leeds. Newport Pagnell - Sport - Newport Pagnell has a large range of sporting and leisure activites. Towcester Racecourse, London Road, Towcester, Northamptonshire, NN12 7HS. Tel: 01327 353414. Newport Pagnell - Shopping - Woolworths - 22-24 High Street, Pagnell, MK16 8AQ. Tel: 01908 610387. Newport Pagnell - Entertainment and attractions - Woburn Abbey, Woburn, Bedfordshire, MK17 9WA. Tel: 01525 290666. Stowe Landscape Gardens, Buckingham, Buckinghamshire MK18 5EH. Tel: 01494 755568. Newport Pagnell - Other information - The town is best known as the home of car makers Aston Martin Lagonda and has the world's oldest iron bridge in use by motorised traffic. Bletchley Park Ltd, The Mansion, Bletchley Park, Milton Keynes, MK3 6EB. Tel: 01908 640404. For hotels accommodation in other areas nearby see Bletchley hotels & Bedford hotels. High Wycombe is 33 miles from London. It is 54 miles from Brackley to Slough and 27 miles from Thame to Dunstable. 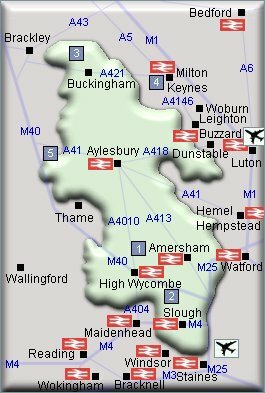 Airports indicated are Heathrow and Luton. Newport Pagnell is about 2 miles north of Junction 14 of the M1 Motorway,between Milton Keynes and Bedford. Rail Stations (Not all stations shown). There is no station in Newport Pagnell. - Waddesdon Manor, Waddesdon, Nr Aylesbury, Buckinghamshire HP18 OJH Tel: 01296 653226. waddesdon.org.uk.